If you are a caring and compassionate person who is interested in pursuing a nursing specialty where you can help patients who are chronically or critically ill, you may want to become an oncology nurse. 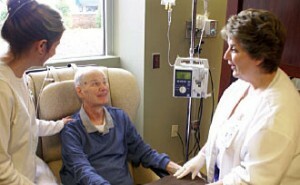 Oncology nurses provide care for cancer patients of all ages and supervise other nurses who assist. They will monitor a patient’s condition, prescribe medications to alleviate pain and maintain comfort, and help provide support to family members of the patient. It can be tough position, but for the right candidate oncology is a specialty that is rewarding and fulfilling. In the nursing profession, you must complete specialized training before you can get certified to become a specialist. If your goal is to specialize in oncology in hospitals, medical offices, hospice, or ambulatory care centers, you will need to get licensed and then meet the qualifications to test for your professional certification. Read on, and learn more about the steps that anyone interested in oncology nursing must take to become an advanced practitioner. nursing program. You can choose between a four-year Bachelor of Science in Nursing program or a shorter two-year Associate of Nursing program depending on how quickly you want to start your career. You can apply for licensure with your associate’s, but the additional education is needed to become a nurse specialist. If you want to take the quickest path to oncology nursing, you are best suited to earn your BSN instead of pursuing an ASN. The next step will be to apply for the National Council Licensure Examination so that you can become a Registered Nurse. As long as you meet the credit requirements and the clinical requirements, you can sit for your standardized professional exam so that you are able to practice in your state. After you pass the NCLEX-RN exam, you will be classified as a practicing nurse. You must get professional experience providing acute care to patients in a medical care setting to get hired as an oncology nurse, but you also need a graduate degree to gain a special set of skills. All nurse practitioners who are certified in oncology must earn their Master of Science in Nursing through a program that has been recognized by your state’s licensing board. You need to check to see if the MSN program is accredited before enrolling and select coursework that is related to oncology to specialize your degree, according to the Commission on Collegiate Nursing Education. The Oncology Nursing Certification Corporation is responsible for testing and granting certification to professionals who meet the qualifications and have demonstrated expert knowledge. To become a Oncology Certified Nurse (OCN), you will need an MSN degree. You must also meet professional nursing experience requirements to sit for the test. Be sure to review the test dates and use preparation materials so that you can become a specialist in oncology or a specialized area of the field. The demand for oncology nurses is extremely high, because it can be a very emotional field to work in. If you have what it takes to be supportive and still gain a specialty knowledge, you may want to start a new career and study to become an oncology nurse.